The Moussa family are actually based off of a family my Mum works with in Sims 3. I created TS4 versions of them to explore all the new features in the game. Quick introductions first! I added profiles for the family over here. Seth is an actor and his very first role is a pirate selling...washing powder. 'Salty Suds' his director said. All that's required is for him to spin the ship's wheel, mop the deck and advertise the product. Pretty easy stuff! Seti's very proud of Seth. He hugs his brother when he comes home from an audition or from filming. 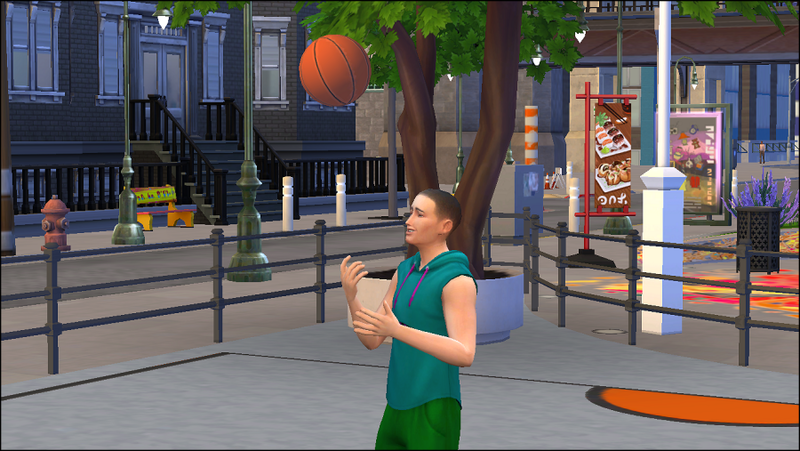 He thinks it's a very good start for Seth, especially as they only arrived in San Myshuno a few days ago. Aziz was sitting in the square in front of their apartment. He doesn't think much of the neighbours so far. Most of them are a little...wacky for his taste. 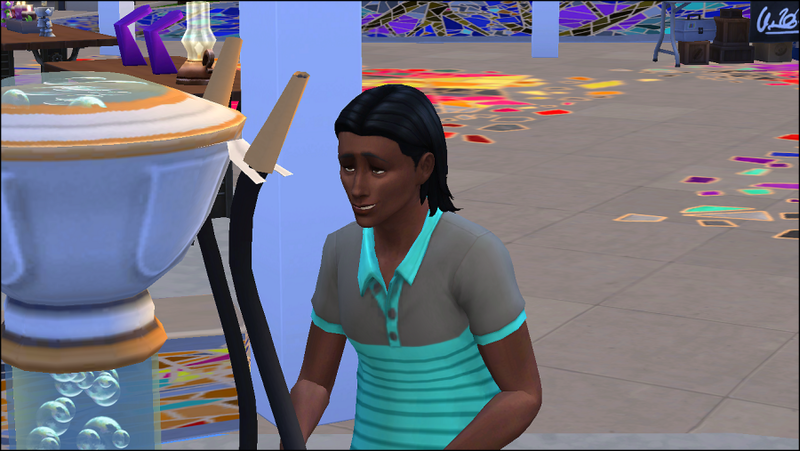 Seth went out on a date with a local girl he'd met, Zoe Patel. 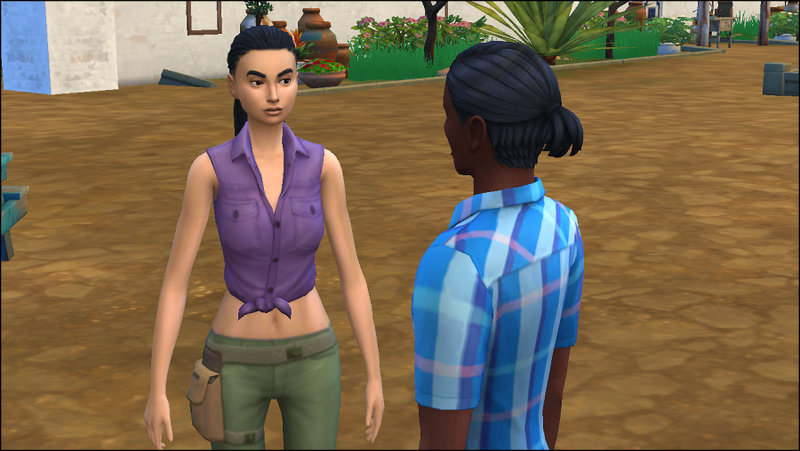 They first met at a lounge in Del Sol Valley when Seth was trying to meet a big celebrity. The date was appropriately on Love Day and while it wasn't the roaring success he'd hoped for, it was a start. In an apartment with five men, somebody needs to learn to cook. Seti decided to bake some brownies for his father and brothers. Seth was amused by the mess his brother was making as he told him all about his date with Zoe. Seth had a new acting role. He was playing a doctor in an advert for prescription medication. 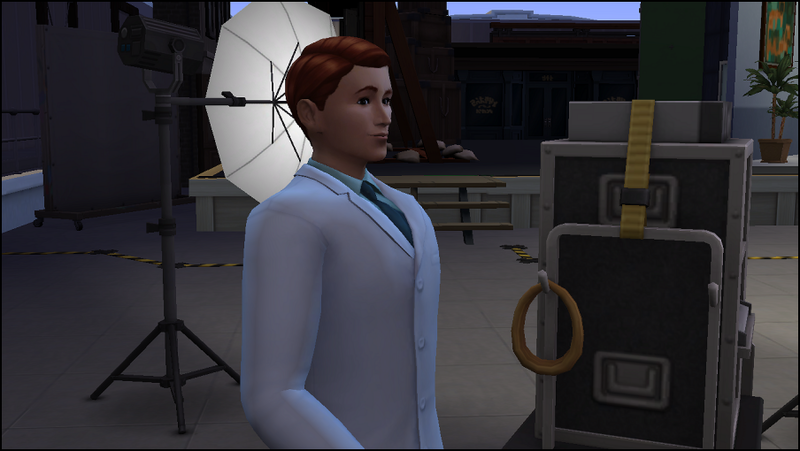 Something about the white coat and smart hair cut made him feel super confident about his new role. He found his co-star to rehearse with and introduced himself. Yay! I used to love reading about the Moussas (how is your mum btw?)! Since the sun was shining brightly, Aziz and his sons went down to the Flea market. 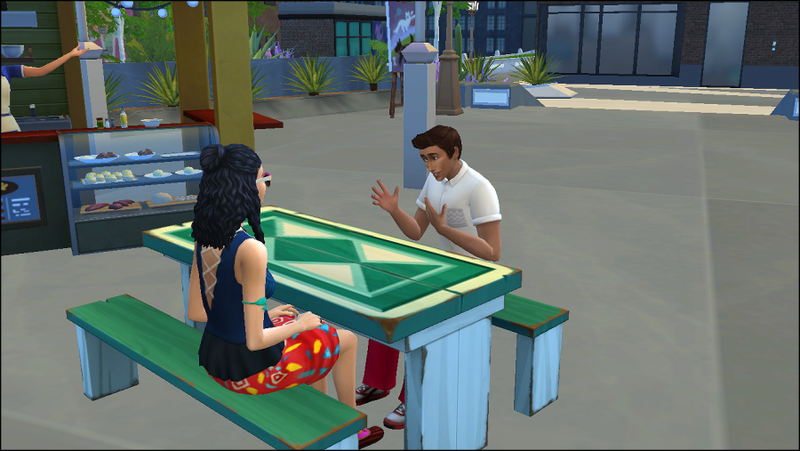 Seth had been hinting about going since they'd moved to San Myshuno and it seemed the perfect day to give it a try. Azi, however, showed no interest in the market and instead preferred playing basketball. Similarly, Pazir showed no interest in the market and instead explored the bubble blower. He appeared to have inhaled too many bubbles, since he had this dazed look on his face! Ra wanted to try out some of the food. 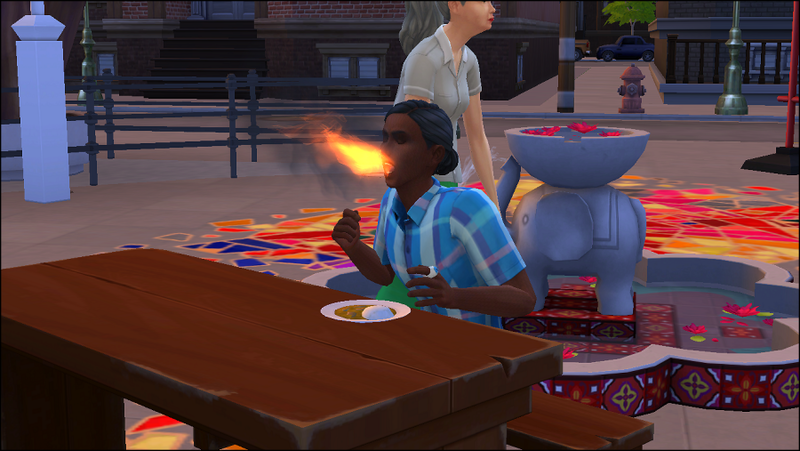 Unfortunately for Ra, he doesn't have much of a spice tolerance yet so his mouth was, almost literally, on fire. Since he lives so close to the Spice district, it's probably a good idea to work on that. 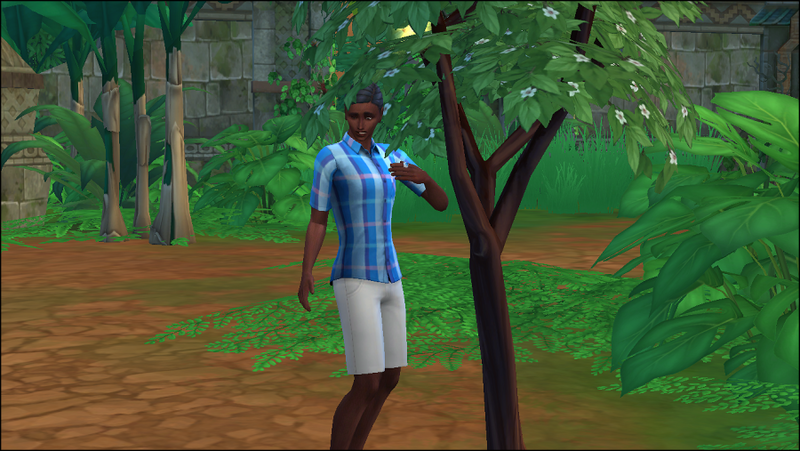 Ra's aspiration is archaeology so it stands to reason he should start holidaying in Selvadorada. When the family returned to their apartment, he got on to his travel agent and booked his flight. It was a long flight and the food on the plane wasn't up to much. 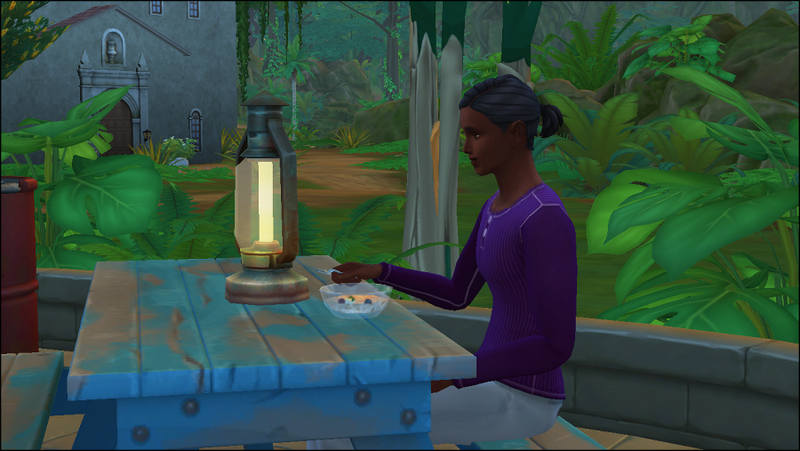 Ra got settled into his tiny cabin at the edge of the jungle and sorted himself with some oatmeal. I personally wouldn't have trusted the electrics but I'm not Ra. His first meal out in the fresh air, away from the sounds of the city! The jungle was every bit as beautiful as Ra had imagined it to be. His hands might be a bit scratched from the struggle into the depths of the jungle but it was worth it. He even found an avocado tree, all ready for harvest. Since Aziz is a gardener, Ra thought he might like to grow one of his own one day. I think Ra's something of a secret daredevil. He went jogging across the bridge quite cheerfully, admiring the view as he went. 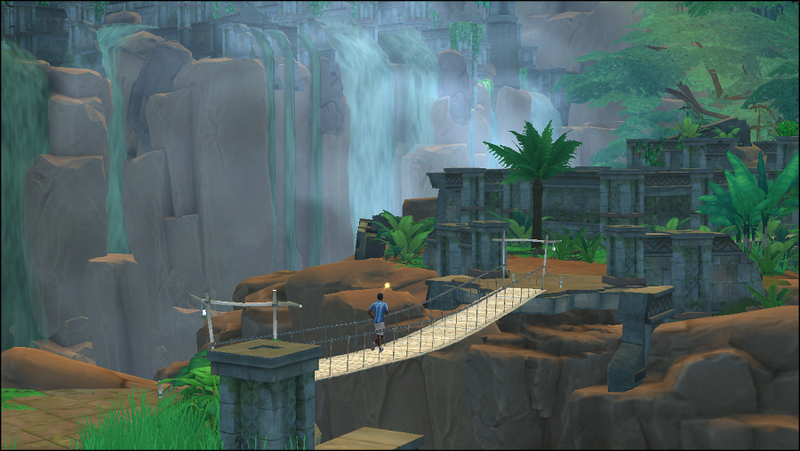 The waterfalls were stunning and certainly nothing like he'd ever seen before, not even on family holidays to Shang Simla as a child. His first digsite! 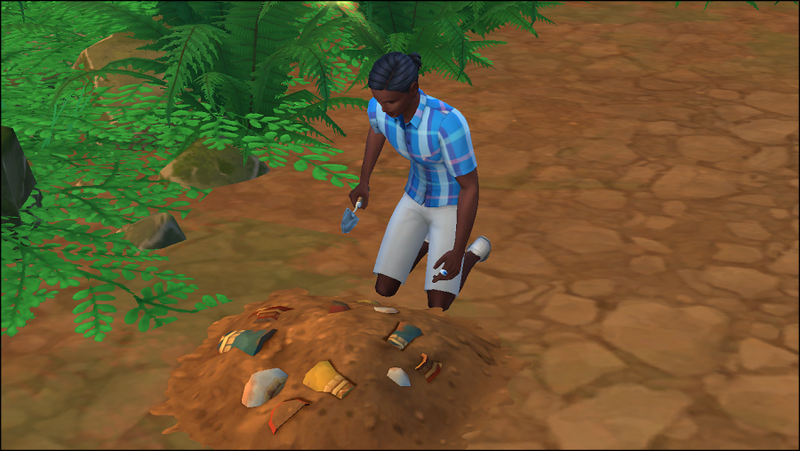 He very carefully dug around the artefact before storing it carefully. He'll be able to study it more closely later, when he gets back to the cabin. Unfortunately, Ra lost his machete when he first entered the jungle so it's hands-on from now on! Ra couldn't get over the beauty of the landscape. 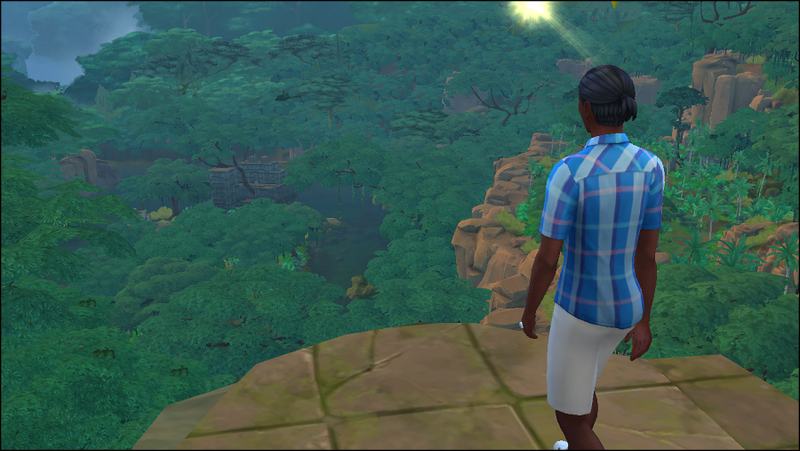 He felt on top of the world as he stood on the ledge and stared down at the treetops below. It looked so beautiful and Ra wished he'd remembered to bring a camera with him. 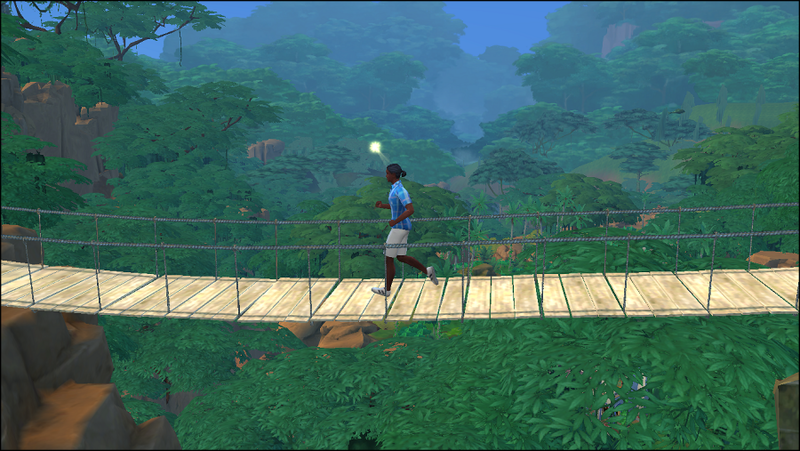 He hadn't expected the jungle to be so picturesque! Once he'd finished for the day, Ra went back to the market to stock up on supplies for his next trip to the jungle. He met a local girl, Belinda, who told him a little more about the jungle and their local culture. Could something be brewing here, I wonder? 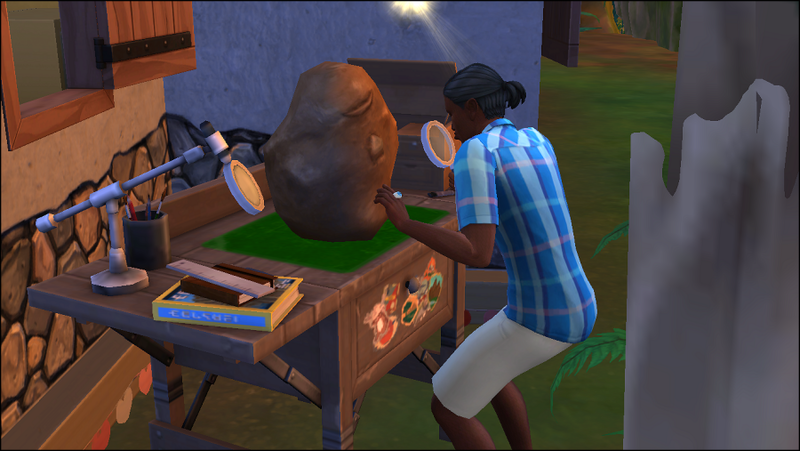 Towards the end of the break, Ra got his archaeology kit out to begin examining the artefacts he'd collected. He only got as far as ducting one down before having to go home. 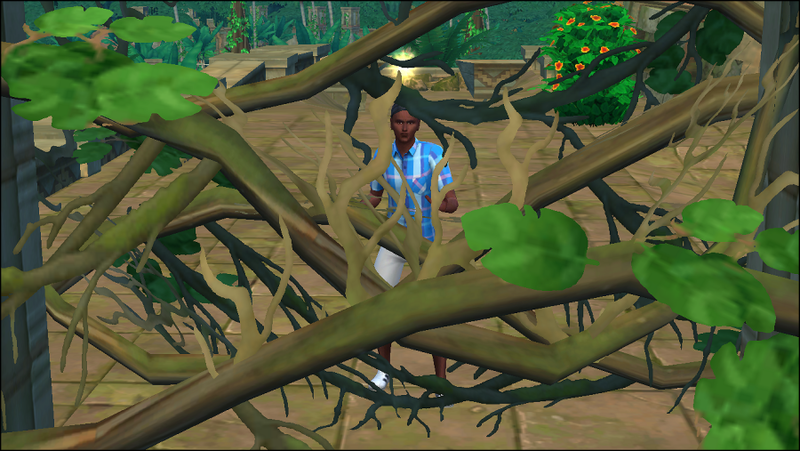 He vowed he'd be back in the not too distant future to continue exploring the dense jungle! 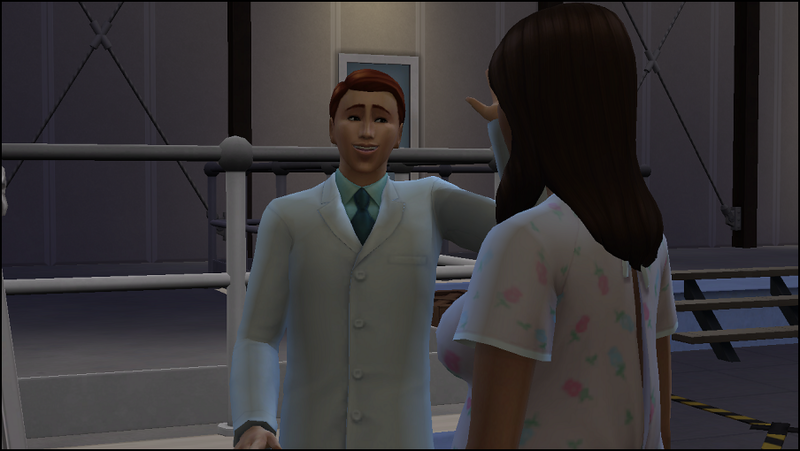 Oh, I am happy to see your Simmies back in action! I also want to play jungle adventure now! Thanks Tito! It's the first time I've played Sims 4 in over two years so I've a lot of catching up to do! Seth's keen to meet as many celebrities as possible to boost his profile. 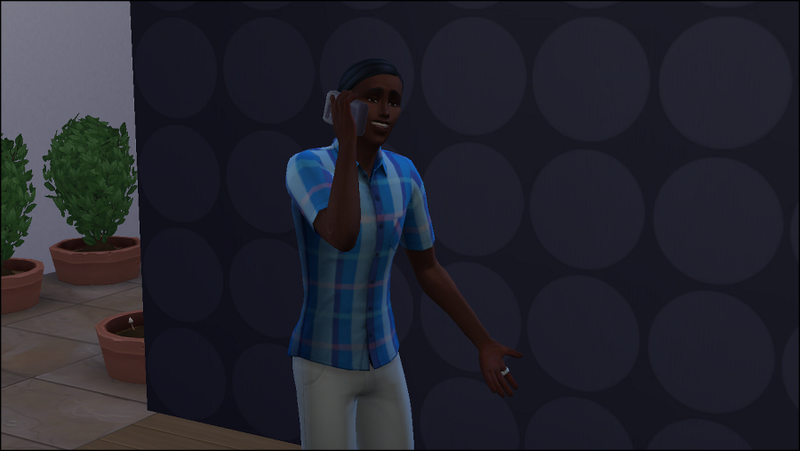 Zoe, the bartender he met before, texted him to let him know about a meet and greet at the lounge where she worked. She invited him to join her after her shift, so he took Seti along with him. Seti wanted to get more used to playing music to an audience. 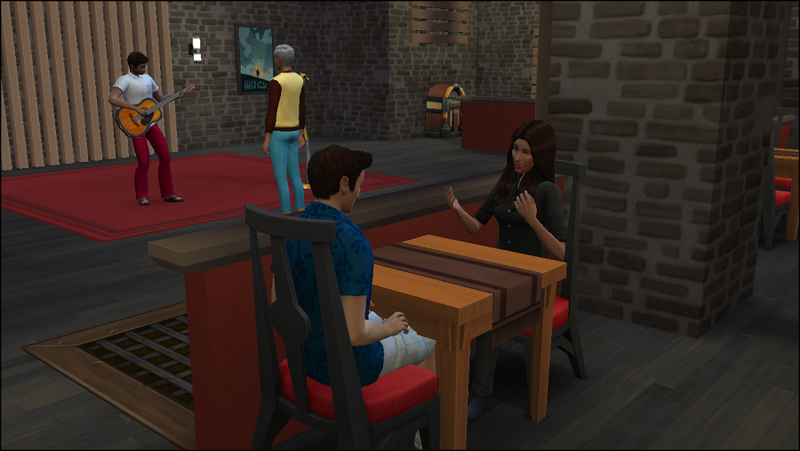 Seti got incredibly excited to see new celebrity, Kayla Aria, at the lounge. He asked for a photo with her and she was more than happy to oblige, to the envious gaze of the other men in the lounge! He even managed to get her autograph, which made his day. While Ra had been away, Aziz had been redecorating the lounge to suit the new sofa Seth had picked up at the flea market. 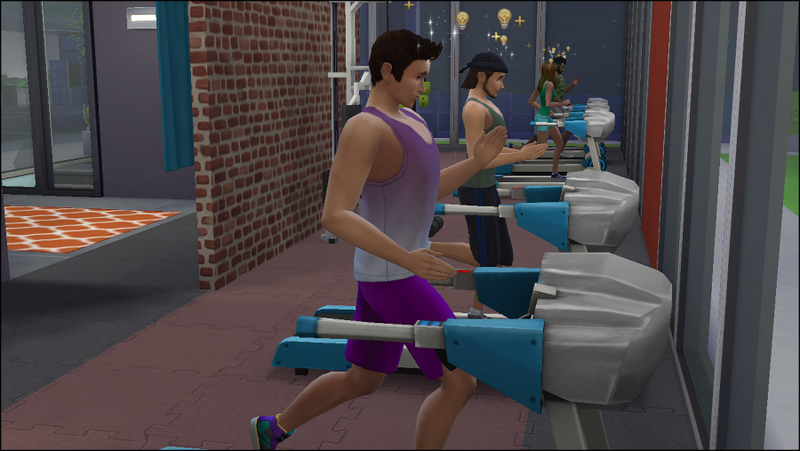 In order to be an adored celebrity and a popular actor, Seth thought it would be good to get in shape. He hopes to go for a workout at the gym a couple of times a week. He was delighted to spot Kayla at the other end of the gym. Seti would be jealous! Seti was in fact out making friends. He'd met a fellow music lover outside their building and they had a surprising amount in common. They talked about the greatest guitar solos, singers and albums. He began wondering if setting up a band might be a good idea? Not everything was going well however. They were having continuous problems with their neighbour, who had loud parties well into the night. When Ra confronted him one night, he found him in a maid's uniform????? *Gameplay Note: This neighbour is a funny fella. He introduced himself the day they moved in by commenting on the cooking smells wafting into the hall. He then came round with the welcome wagon the following day, then kept knocking on the door because he was bored. Then, he has loud music blaring and gets offended when they complain. Then, he's back to chatting to them! Seth's workouts at the gym must have paid off. 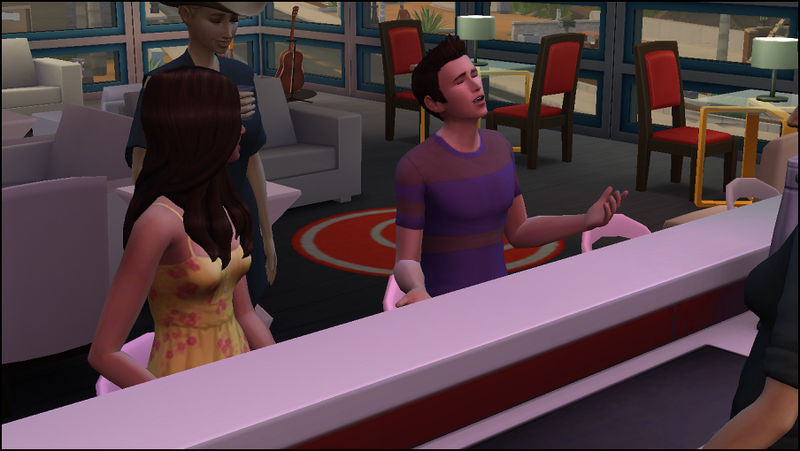 Zoe invited him over to her house in Oasis Springs one afternoon after work. It was a very hot day and Seth was looking forward to getting to know her better. 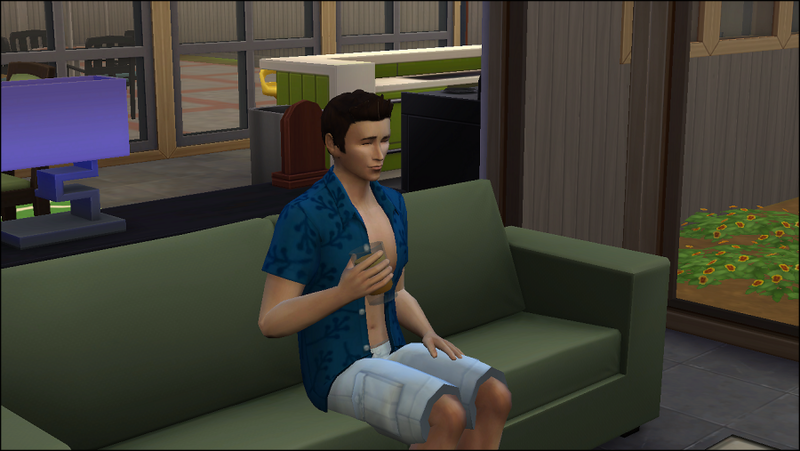 A quick orange juice while Zoe's in the bathroom to cool down, since there's a heatwave in Oasis Springs. Success! Seth and Zoe decided to make their 'relationship' official. Since it was too hot to be outside, they put a romantic movie on the TV and snuggled up to enjoy the last of the summer sunshine. (12-09-2018, 02:45 PM)MissyHissy Wrote: Not everything was going well however. They were having continuous problems with their neighbour, who had loud parties well into the night. When Ra confronted him one night, he found him in a maid's uniform????? 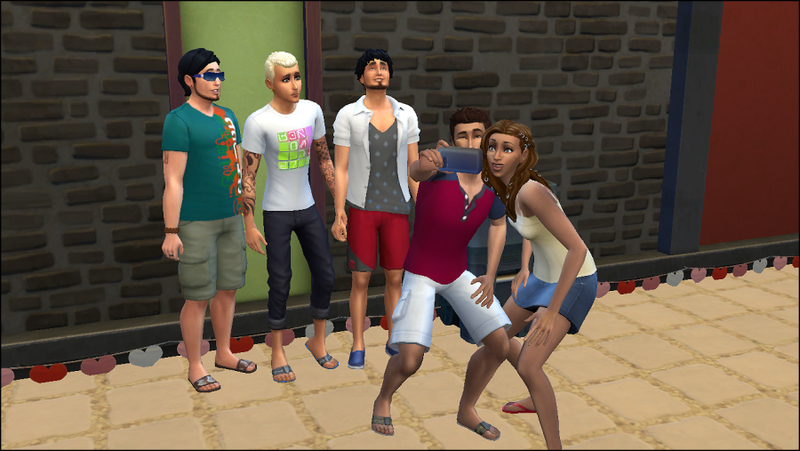 I don't know, Salim is kind of pulling that look off loool.